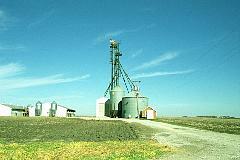 I traveled to northern Iowa and Southern Minnesota on Thursday, November 1, 2001. It was 65 degrees out with a fair breeze blowing. I left home about 6 a.m. to drive down to Iowa to hunt. 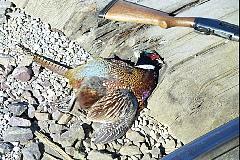 You can hunt an hour earlier in Iowa than Minnesota - I have licenses to hunt in both states. Last night was Halloween. Here is what remains of the first full moon on a Halloween in 46 years. There won't be another for twenty more years. 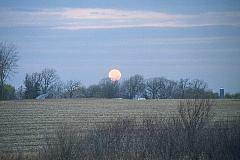 It was also a "blue moon" - the second full moon in October 2001. This was taken near Faribault, Minnesota. I decided to get back on the interstate and go down one more exit, most likely that will be about 10 miles. 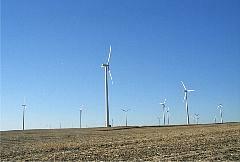 I found my way to the interstate and was confronted by these giant electricity generating windmills. I counted about four dozen. 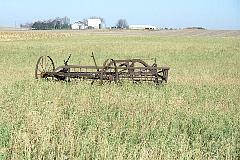 How long has this item been sitting in this alfalfa field? It can't be for decoration, nor does it look like it is in working condition. It makes for a good picture, even if I can't imagine why it is here. I can't see a farmer just letting it set out here for eighty years. Just down the road we have this. I walked out to see if it was an abandoned pump/well of a farmhouse or the pump mechanism from a windmill. Windmill. 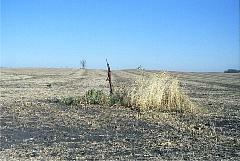 This was a bean field. 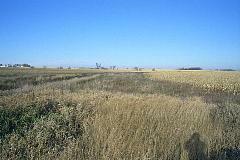 Most of the bean fields seemed to have been picked already, only about half of the corn fields half been picked. Usually about 90% of the corn is out this time of year. I walked down this track and went wide to the left when I came to the trees and thickets you see in the distance. Note the yellow signal light visible when you enlarge this picture. I had been hearing a train whistle for some minutes. I was way out wide left when a 100 car two engine fast freight rumbled by. I figured that would flush any pheasants in the railroad right of way and maybe a rooster would fly over and land by me. No such luck. I had to cross a small stream and made my way to the base of the raised roadbed. 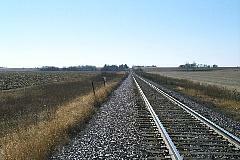 With some effort and winded from my walk, I climbed the steep side of the railroad roadbed and stood between the tracks. I figured this hunt was over. Suddenly, two hens flushed. Then another hen flushed. Then I heard the cackle of a rooster. Excited and rushed, I fired once and didn't even aim. It was a swing shot, so I forced my cheek down on the stock, swung from right to left and pulled the trigger as I passed him. He fell and landed dead in a picked soybean field. 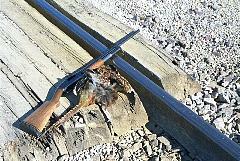 Here is the rooster and my grandfathers's/father's model 12 twelve gauge shotgun. The wind is blowing his feathers. 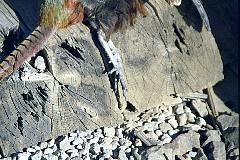 If you notice his feet you see the spur on the back of his foot is very small - he is a year old rooster. Look at the purple color on his breast. Notice the powder blue feathers on his rump. All last year I passed on shots because I thought a rooster was a hen - for some reason some roosters (because of the light) would look brown to me so I would hold my fire. Now, aside from a cackle that only roosters make, I look at the tail. This guy's long tail almost looked elastic as it crazily swayed back and forth as he flew. A factory farm with and American flag flying defiantly. I saw many flags flying all over the countryside. "'Ya 'lookin fer pheasants, city fella? Well sir, you go south 'outta town until you hit the first stop sign. 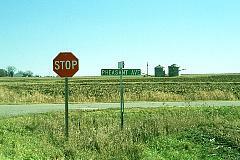 Turn right, and most live along Pheasant Avenue ..." Actually, I saw no pheasants on Pheasant Avenue.